Resveratrol is a plant compound that supports the healthy expression of genes associated with slowing down aspects of the ageing process — as well as overall health. Optimized Resveratrol also contains synergistic phytonutrients like quercetin, fisetin, and a grape and wild blueberry fruit blend for additional polyphenols, anthocyanins, and more. Best known as a compound found in red grapes and red wine, resveratrol helps promote and maintain optimal health and longevity. This formula contains trans-resveratrol, the form abundant in red wine, which is well-absorbed and stable. Resveratrol also promotes healthy insulin sensitivity, encourages enhanced mitochondrial function, supports a healthy inflammatory response, and has demonstrated beneficial cardiovascular activity. We’ve combined trans-resveratrol with botanical compounds quercetin and fisetin. Fisetin helps inhibit oxidative stress and inflammatory factors, helps maintain mitochondrial function, and has been widely studied for its neuroprotective properties and ability to promote healthy cell division. Quercetin is an important bioflavonoid recognised for its ability to help inhibit oxidative stress and inflammatory factors, as well as promote cardiovascular health — including helping to maintain healthy blood pressure already within the normal range. Quercetin is also being actively investigated for its neuroprotective properties and ability to promote healthy cell division. Optimized Resveratrol also includes a grape and wild blueberry blend packed with additional polyphenols, anthocyanins, and more to promote longevity and youthful gene expression. The suggested dose is just one capsule a day, meaning each bottle of Optimised Resveratrol provides a two-month supply. 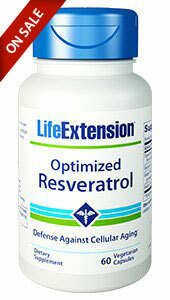 Activate your longevity genes with Optimized Resveratrol!